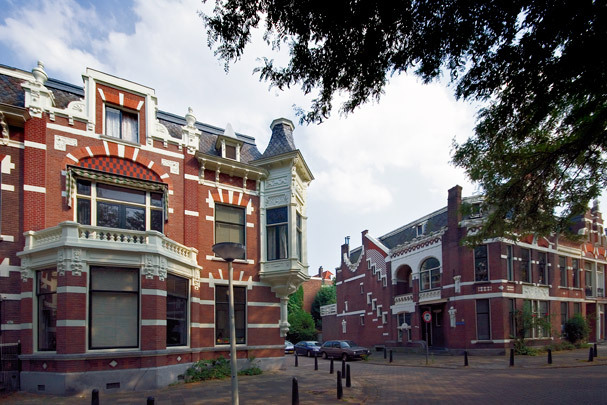 Laid out at the end of the 19th century, Avenue Concordia and Voorschoterlaan (formerly Avenue Prins Alexander) have their share of exquisitely decorated townhouses in various 19th-century styles of architecture, with the occasional Art Nouveau motif thrown in. Rotterdam architects of repute who designed houses here were Barend Hooijkaas Jr., J.I. van Waning, C. Bruijnzeel, De Roos & Overeijnder and W. Molenbroek. The lesser-known architect H.A. Lieuwens designed the Art Nouveau interior of Carlier the confectioners (Avenue Concordia 57). Part of Avenue Concordia was destroyed during the 1940 bombing raid and now comprises reconstruction-era architecture. The blocks on the corners with Oudedijk by contrast were built as part of the later urban renewal programme, following the construction of the metro.